Bucket lists. Some people have them, some don’t. Our travel list includes stepping foot on each continent and more specific things or places like the great migration in Africa or ferry-hopping around the Scottish islands. South America has been on our bucket list for a long time, but no plans had been made. It was just out there until our daughter Bonnie suggested that we go along with her to Peru. She was leading a six day photography tour to Cusco and Machu Picchu, a MAJOR bucket-list destination. 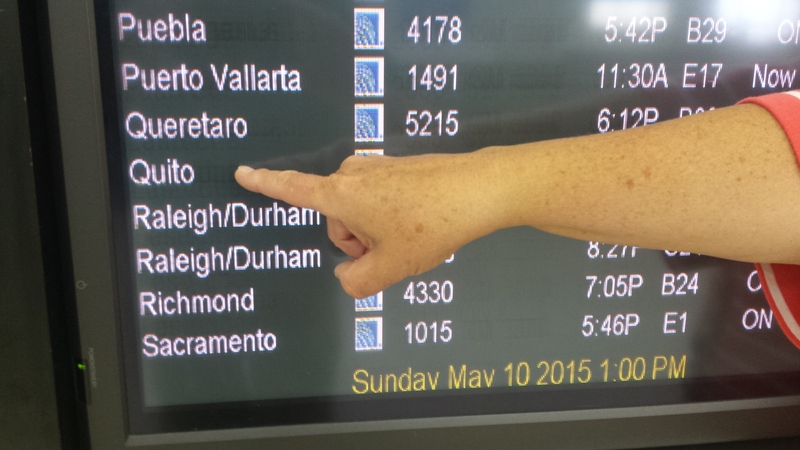 It’s a long way to Peru from the Northwest – thirteen plus hours from Seattle. If you have to sit on an airplane for that long it makes sense to spend more than six days where you’re going. So, we picked another place off of the bucket list and added eight days in the Galapagos Islands to the front of the trip. Quito, Ecuador – Travel to the Galapagos from the US will likely take you through Quito or Guayaquil, Ecuador. The Galapagos are part of Ecuador and the Ecuadoran authorities keep a firm hand on who goes to and from the islands. We had only one day in Quito and were very fortunate to have an excellent guide, Jorge, to show us around. Quito is a Spanish colonial city that is located just 15 miles south of the equator. 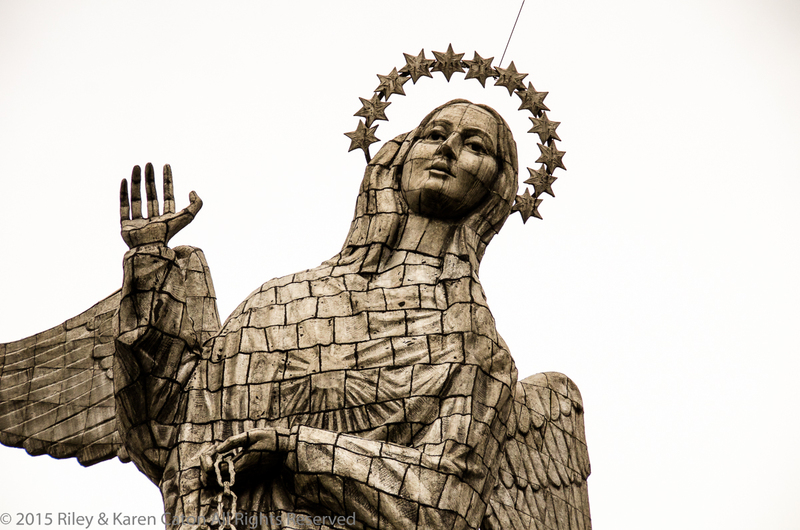 Click here to see a slide show of Quito. 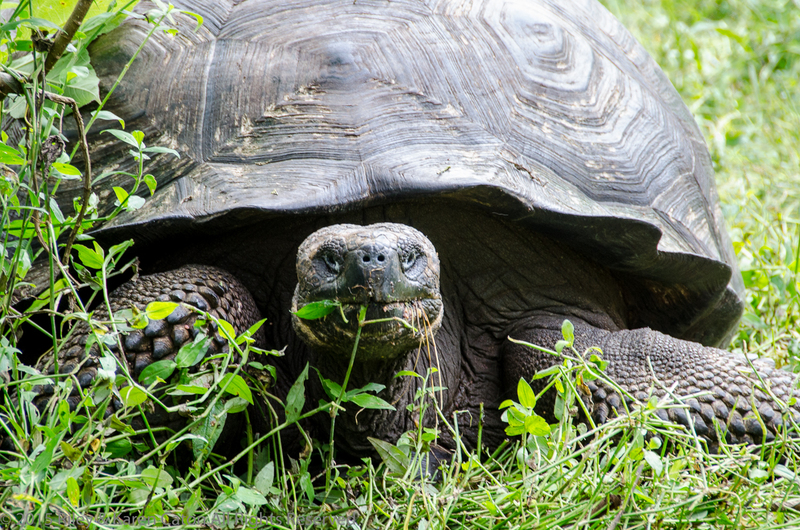 Galapagos Islands, Ecuador – “The tourists are saving the Galapagos” said our guide Billy. “If we didn’t have tourism, the locals would revert to their old occupations of fishing and farming which harm the islands.” Click here to see a slide show of the Galapagos. Cusco, the Sacred Valley, and Machu Picchu, Peru – From the Pacific Ocean to the Andes, from colonial cities to ancient Inca ruins, from pastoral countryside’s to busy urban streets, this country has something for everyone. Everywhere you turn there is another Inca ruin, or a church built on top of a ruin. In the big cities, hawkers try to sell you trinkets on the streets. In the villages, the sales pitch is much more subtle. And there is the crown jewel, Machu Picchu. Click here to see a slide show of Peru. Lost in Alaska or Lack of Inspiration? It’s been a long time between posts. Nearly nine months. We’ve been trying to think up some great excuse for the lack of posts and have come up with lots of good ones. The first excuse that comes to mind is the concept of being lost in Alaska. Our blo gging initiative evaporated on the Kenai Peninsula when salmon started biting our bait and filling the freezer. Fishing is a little like getting lost. When the fish are biting, there’s nothing more important than catching one. After all, who wants to sit at a computer when the fish are biting? It’s like the bumper sticker we saw the other day that said “A bad day fishing is better than a good day _____” (insert any other activity here). So, yes, we were lost in Alaska. Burn-out is another great excuse. You know, we were soooo busy that there was absolutely no time for writing. There were fish to catch and things to see and people to visit and business to do and, and, and games to play on the computer. Yep, totally stressed out. Of course, there were days of driving. It’s over 6,000 miles from the Washington/Canada border to Alaska and back, and another 6,000 round-trip between there and Big Bend, TX. We can’t drive anywhere without looking for at least one geocache, sometimes many more. It took us almost nine months to get to where we are today. A journey that would have taken a normal person about 30 days to complete…. Finally, we spent four months working our tails off volunteering at Big Bend National Park. Nothing to it really. We put in about 50 hours a week and had a nice place to park The Dip for free. But really, do you want to sit down at the computer and write something after working all day? Did I mention that the 50 hours a week was between the two of us? In reality, we just weren’t in the mood. Writing something that is worth reading by other people isn’t easy. Sure, there are times that the words spill out of our brains like water over a water fall, but the rest of the time it is akin to work. Yep, real work. It takes inspiration and some really great subjects to keep up a blog. So we’re going to South America in search of some inspiration which, hopefully, will entertain you along the journey. There’s something to be said about going to the end of a road. We do it all the time when exploring National Parks, Forests, or Bureau of Land Management (BLM) land. Maybe it’s that old adage of “what’s beyond that curve, or what is up ahead”. Notch it up a few degrees and the end of the road is above the Arctic Circle and as far north as you can drive in the Yukon, Northwest Territories, or Alaska. It’s as far north as you can drive in North America. We started out easy, getting into the practice of leaving The Dip behind by driving to Keno City in the Yukon. It’s the end of the Silver Trail, ending at 6000+ elevation looking out over the mountains and forests, as far as you can see. 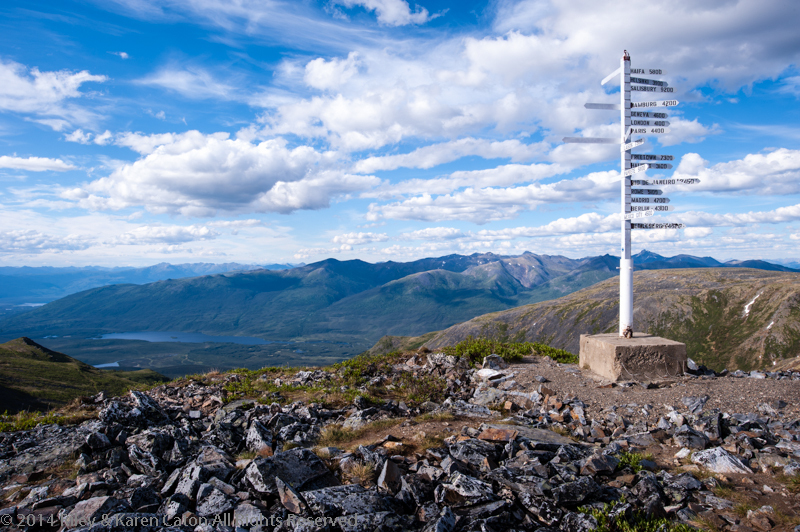 The second foray took us up the Dempster Highway from Dawson City, Yukon, above the Arctic Circle, to Inuvik in the Northwest Territories (68 degrees N.). The term “Highway” is use loosely here. Over 900 miles round trip, this rock, gravel, potholed and sometimes muddy road is famous for being showcased on the Ice Road Truckers reality show. It’s on the bucket list for motorcyclists and bicyclists. Inuvik is at the end of the road, a government town with really nothing going for it, except the services it provides to First Nation people and outlying villages. To go any further north, you have to wait for the river to freeze solid, building an ice road to the village of Tuktoyaktuk. The third journey took us even further north. Leaving from Fairbanks, AK, the Dalton doesn’t start until you’ve traveled 80 miles up the Steese and Elliot Highways. The Dalton used to be called the “Haul Road” because it was built to haul the supplies and materials to build the trans-Alaska pipeline. 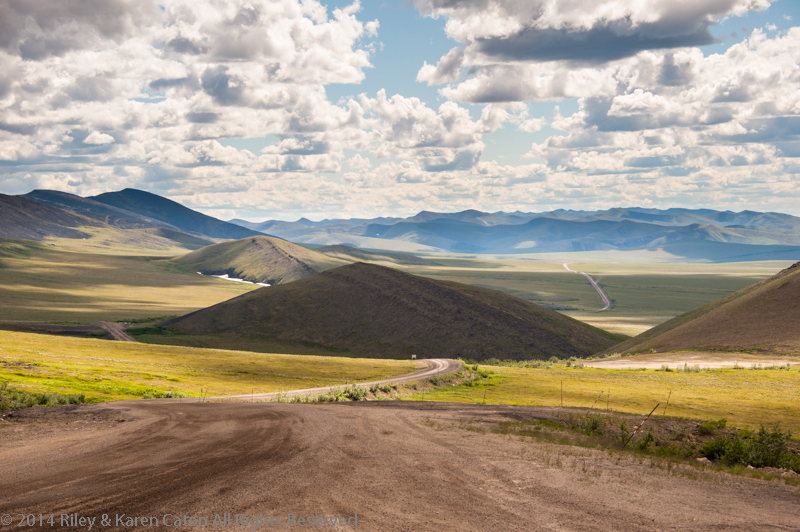 Even today, the road is used to transport everything imaginable to and from Deadhorse Camp/Prudhoe Bay oil fields. Reaching Prudhoe is anti-climactic. There’s nothing there except for the commerce and industry required to operate the oil fields. No one lives there; there are no homes, only industrial hotels called “Camps”. Everyone is transient, staying for a set number of days. You either work in Prudhoe or you are a visitor. You may stay a few days or a season, or you rotate in and out, two weeks on, two weeks off, for your company. There’s really no reason to visit Prudhoe or Inuvik, unless you enjoy the challenge of getting to the end of the road. For some, the bucket list includes the Arctic Circle or the Arctic Ocean. For others, it’s the wildlife like bears, birds, caribou, or muskoxen. We’ve crossed the Arctic Circle twice – well, really four times if you count going north and coming back south again. 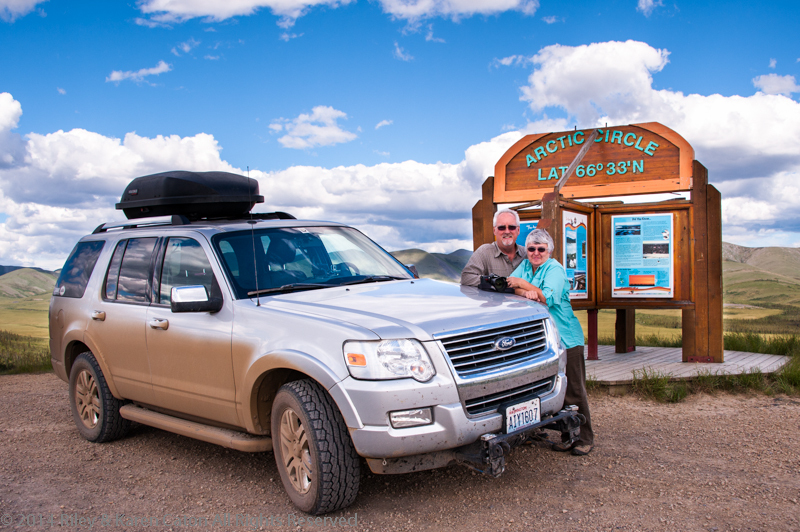 We joined the Arctic Circle Club, having crossed over 66° 33’ on the only two roads in Canada and the U.S. that go this far north. Another thing checked off of our bucket list. It really is all about the road and journey, not the destination. The wilderness extends for 100s of miles in all directions. There are mountains, boreal forests, and tundra. The wild flowers are just beginning to bloom. Arctic lupines, fireweed, cottongrass, arnicas, and bear-root line the road, tundra, and marshes. There isn’t anywhere else on the continent where you can get in a car and drive this far north, passing through this much change in terrain and vegetation..
For us there was wildlife, a herd of caribou, 500 or more, a small herd of muskox, a moose, a black bear with cubs, and red foxes. There were short-eared and boreal owls, jaegers, geese, tundra swans, loons, eagles, and other bird life. 500 or more caribou graze near the Trans-Alaska pipeline. Yep, it’s about the journey, not the destination. 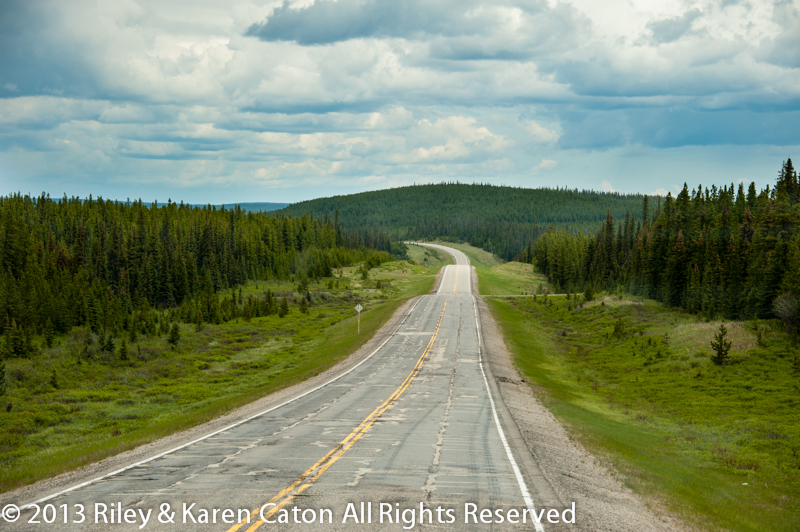 Click here to see a slideshow of our images from the Dempster, Dalton, Dawson City, Chicken, AK, and Denali National Park. • Falken Tires – Sponsorship of six Wildpeak AT tires that kept us rolling on those rough, muddy roads. They’re still fantastic! • Bonanza Gold Motel & RV Park, Dawson City, YT – Bonanza Gold comped part of our stay in Dawson and they took care of The Dip while we trekked up the Dempster. • Riverview RV Park and QuickStop, North Pole, AK – Riverview discounted our stay in North Pole/Fairbanks and took care of The Dip while we trekked up the Dalton. • Coldfoot Camp & Deadhorse Camp – Comped part of our stay in Coldfoot and Deadhorse/Prudhoe. • CRAWL Magazine – Technical advice, encouragement, and sponsorship support. • WaveJourney.com and OutdoorX4 – Support, encouragement, and travel writing assignments. “Welcome to Keno City!” Those words greeted us as we walked up to the old Keno City Hotel. Our welcome came from the heart of a man who enjoys sharing his town, his hotel, his dream…. 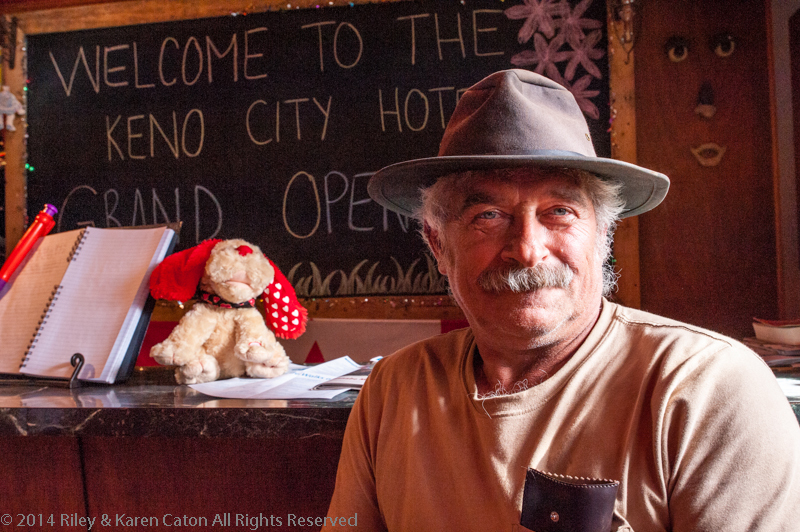 Meet Leo Martel, a former miner, now turned entrepreneur who is rebuilding his dream, a relic of the days when Keno City was the center of Yukon’s silver mining industry – the Keno City Hotel. Since the 1980s, Leo has lived in Keno City and for the past several years has been saving his labor of love from falling down. Let’s just say that building codes weren’t enforced in the 1920s! Leo has restored enough of the building to open a bar and restaurant and rooms upstairs. It is eclectic. Every room is different and every bed has a different bedspread. The bar is dark and moody and one wall is adorned with a quilt sewn by Leo himself. You have to love this man; we did just after a short period of time with him. We had so much fun on this part of the journey, we thought we’d recap a few of our favorite places! Many of you know, we love to geocache and to get away from the hustle and bustle. We parked The Dip for a night in the Buckinghorse River Lodge parking lot (freebie) and drove the car back south for 15 miles to check out Sikanni Chief Falls. Yes, there is a cache there that hadn’t been visited in over two years and we’d been told the falls were spectacular. Turned out the falls were spectacular, and yes, we found the cache. If you are reading our North to Alaska blogs you’ve already seen this story. Over the next week, we’d visit Fort Nelson, Liard River Hot Springs, Watson Lake, and Teslin before arriving in Whitehorse. Fort Nelson was just a good overnight stop. The hot springs were awesome as were the wildlife sightings in the area. 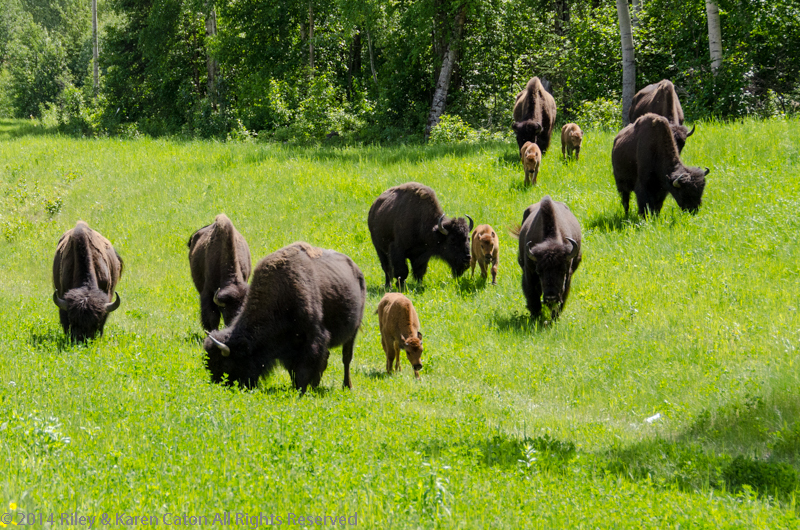 The wood bison herd in this area is rebuilding at a good pace; lots of young calves this year. The Watson Lake signpost forest is amazing; signs from all over the world – many are handmade, but several cities are missing their metal name signs! Watson Lake is also home to the Northern Lights Centre where we enjoyed an interesting video on Black Holes and another on the aurora borealis. Teslin was our favorite stop that week! We’ve gotten into setting up The Dip into whatever campground or RV park we’re spending the night in, and touring later in the afternoon and evening. So, leaving The Dip in the Teslin Lake campground, we wandered in for a late lunch at the only restaurant in town (which is also where the only RV park in town is as well). Next to the restaurant is a small shop featuring local artists, the normal touristy stuff, and an awesome wildlife gallery. The taxidermy quality was excellent and each display has a story on how the animals had perished – most victims of nature. We truly enjoyed the photography on display in the George Johnston Museum. Johnston, a Tlingit Indian captured the soul and story of this tribe with his camera in the 1920-30s. 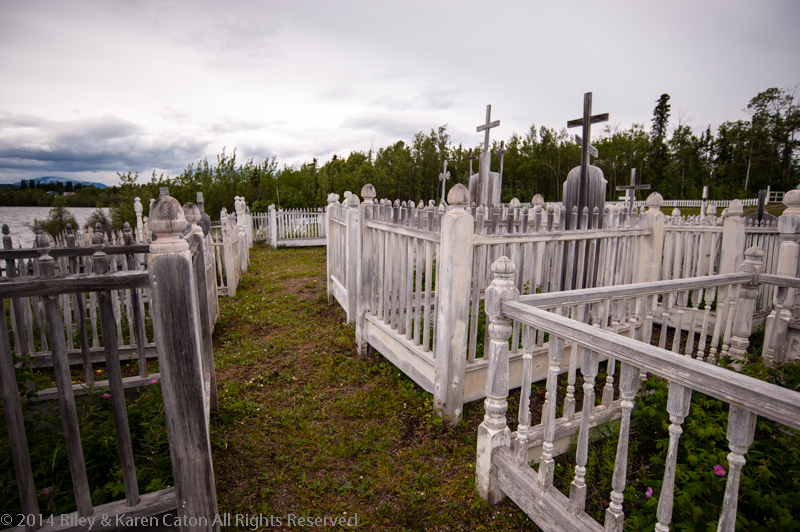 Walking through the Tlingit cemetery along the shores of Nisutlin Bay was a history lesson in the making. The tribe builds fences to surround each individual grave site and we were pleased to see that many of the wood signs were still readable. Click here for our article “A Day in Whitehorse” at http://www.wavejourney.com. We were going to post a blog every Friday, but, as it turns out, we’re either busy exploring the Great North or parked in a place with no internet. Which turns out to be a great way to introduce this blog…. When you leave the Alaska Highway you see nothing but trees, lakes, and streams. Not just for miles, but for hundreds of miles. No cell phone service and no internet until you reach a settlement substantial enough to have that infrastructure. Elk: Six to ten including cows with calves. Deer: Three gorgeous bucks with big racks in velvet. Moose: Just one of the elusive animals. Black bear: Almost too many to count, at least 16, several with cubs. Grizzly bear: Three, a sow with two cubs. Wood bison: Too many to count. At least four herds. Stone sheep: A small flock of four. Bald eagle: Just two so far. Raven: Hundreds, they seem to follow us everywhere. Mosquitoes and other biting bugs abound. No kidding huh? Not sure how to explain this one. They haven’t been too bad, yet… However, we’ve been on the tundra before and know what to expect. Maybe it’s the garlic. The road is rough. In reality, the road’s been pretty good. Sure, there are a few rough patches, but we’ve traveled over 1,750 miles without a problem. Settlements or services are few and far between. We’ve been keeping an eye on the fuel gauge. If you broke down, you might have to wait overnight to get assistance and longer for parts. We may have arrived, but it’s still a little too civilized; especially here where hordes of tourists arrive daily by train or bus from Skagway. We’ll be moving on in a couple days, further north, still seeking the wilderness. Click here to see our photos of the journey from Dawson Creek, BC to Whitehorse, AB. 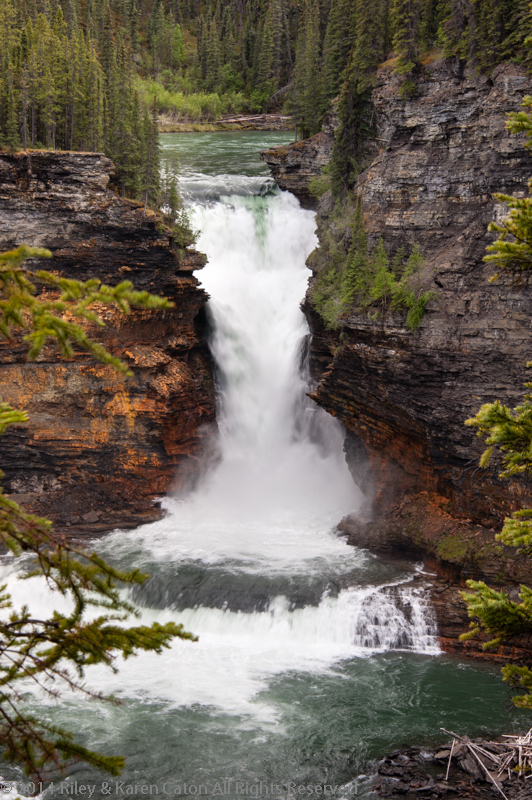 Visions of wilderness in the far north swirled through our head as we left Jasper, AB. The Icefields Parkway from Lake Louse to Jasper presented us with stunning scenery. The landscape along Trans-Canada Highway 16 was as wild as it could be. Turning north from Hwy 16, the road traverses endless forest and our stop at Grand Cache, AB was like being in a frontier town. 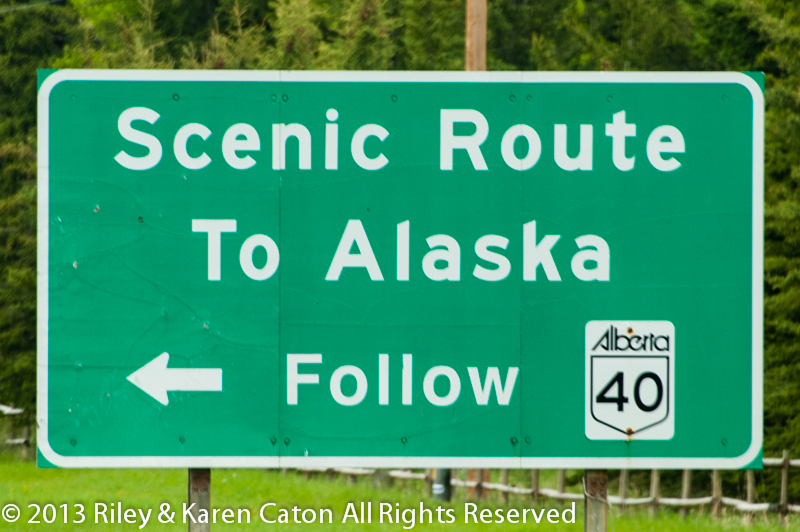 Just getting to the start of the Alaska Highway (formerly the AlCan) was going to be an adventure in itself! Alberta 40 between Jasper and Grande Cache, AB. Then we started seeing more and more traffic. Suddenly, the forest gave way to Grande Prairie, AB, a city of 55,000 with all of the urban conveniences that one could want – big box stores, gas stations, restaurants, hotels, industry, four-lane highways, and housing developments. So much for the wilderness adventure. 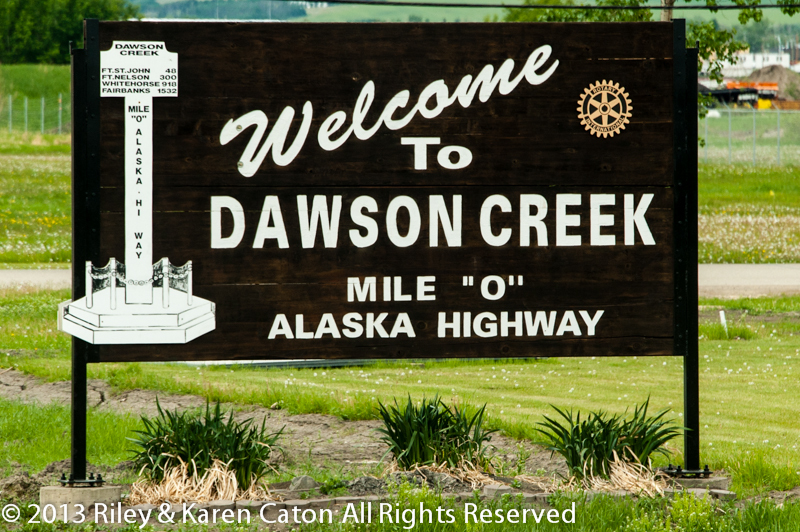 We forged on toward Dawson Creek, BC, famous as “Mile 0” on the Alaska Highway. This must truly be a frontier town. After all, this was the place where, in 1942, the US Army Corps of Engineers and Canadian civilian contractors began constructing 1,420 miles of road through the wilderness, all the way to Big Delta, Alaska. It’s the last stop before launching into the northern woods. In our minds, we’re seeing log buildings, a quaint main street, and lots of sourdough-like men with white beards. Scratch that. Dawson Creek is still Mile 0, but in reality it is just another modern agri-industrial / oil town in British Columbia with 11,500 residents, big box stores, a couple of old buildings, and several nice museums. The wilderness has got to be just ahead…. Click here for more photos from along the journey.